On waves of song, laughter and romance! 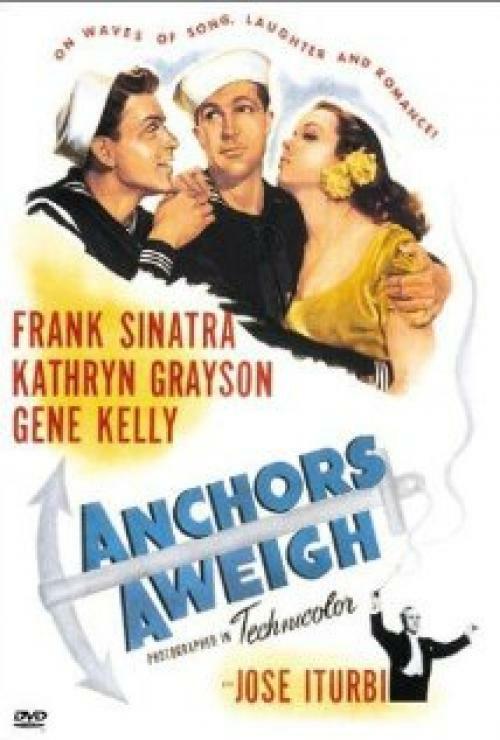 Anchors Aweigh was the first of three pairings of Frank Sinatra and Gene Kelly. The characters they portray here, the virgin and the lothario, would be the same they would play in their other films together. Up until this point in his movie career, Sinatra was a pop singing sensation often brought onto a film project to do a single scene where he would croon out a song. In 1945, Kelly was the bigger movie star while this was Sinatra’s first big film. His singing fame was, however, big enough to get him top billing over Kelly. The movie starts with Kelly and Sinatra playing Joe and Clarence; sailors getting shore leave in California. Joe plans on seeing his sure thing girlfriend Lola, while - innocent as they come - Clarence tags along asking Joe to help him meet a girl. Before their sexual adventures can begin they get hauled into a police station where they are asked to help with a runaway little boy who wants to join the navy. They end up taking him home where they meet his beautiful guardian, Aunt Suzie, played by Kathryn Grayson. She is a struggling singer which gives the script another excuse to break out in song. At first it is Clarence who falls for her but once Joe hears her sing an ear piercing opera song, he becomes smitten. What follows is a love triangle whose resolution can be seen from a mile away. Although Grayson is a good looking woman and a notable soprano, this film works on the chemistry between the two male leads. Gene Kelly had a cocky smile that worked well for his arrogant character while Frank Sinatra, although a bit old for the part, played the wide eyed innocent with complete sincerity. Their strengths complimented each other’s weaknesses. Gene Kelly could carry a tune but was not a great singer. However, whenever they dance together, you see Kelly shine and Sinatra out of his element. 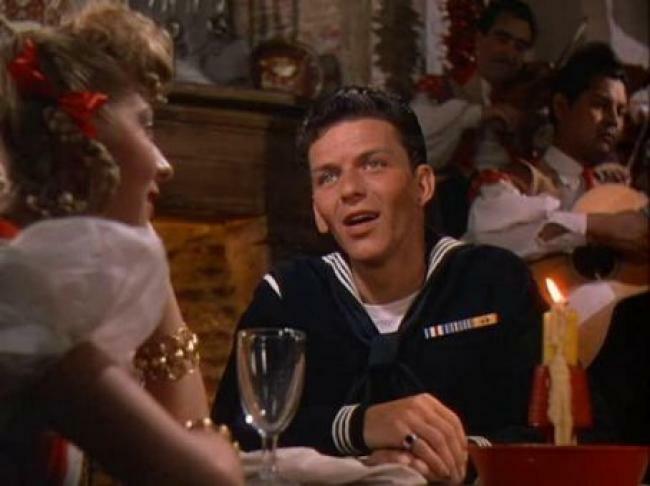 In the scene where they dance in front of the other servicemen on leave, Kelly moves with practiced ease while Sinatra is clearly struggling to keep up. It reportedly took Sinatra two months to learn the routine and seventy two takes to get it right. Gene Kelly choreographed the dance and was known for being a perfectionist. Sinatra later said that he could have made an entire film in the time it took them to make that one scene. Anchors Aweigh’s most famous scene was quite groundbreaking for the time. 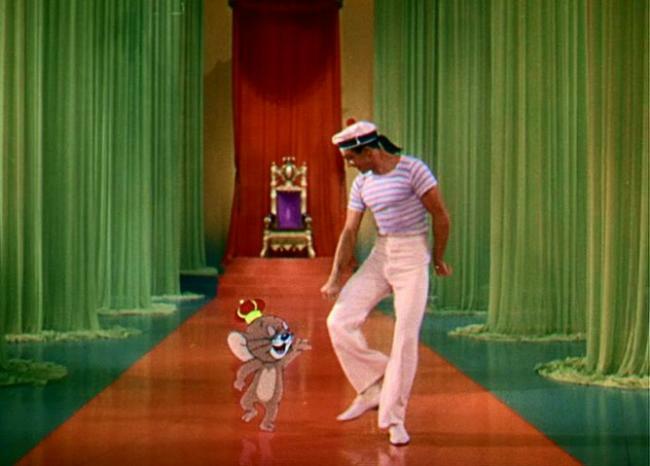 It features Gene Kelly doing a dance with Jerry the mouse, from Tom and Jerry. It was one of the first big combination uses of live action and animation. At the time and for many years to come it was hailed as a special effects marvel. That one scene alone added $100,000 to the film’s budget. However clever that scene was conceived, it has nothing to do with the movie and adds to its long running time. At two hours and nineteen minutes long, this romantic comedy musical could have used a trim by cutting the musical numbers performed by Jose Iturbi, a popular pianist at the time. Likewise, if I ever have to hear Grayson sing again, it will be too soon. Sorry, but her singing is not for me. Part of the plot revolves around Clarence pretending to know Iturbi and makes Suzie think he has arranged for her to sing for him. I had more apprehension than anticipation for that scene. Although this was the beginning of their team ups and has plenty to offer, MGM improved on the formula with their next effort, Take Me Out to the Ball Game. It has a shorter running time and the songs never stop the movie. Still, anytime spent with Gene Kelly and Frank Sinatra doing what they do best is time well spent. Jerry the Mouse and Gene Kelly in Anchors Aweigh. Anchors Aweigh plays like a West Coast version of the stage hit On the Town, that had opened on Broadway the previous year (1944). Instead of sailors on shore leave singing, dancing and falling in love in the Big Apple, you have sailors on shore leave singing, dancing and falling in love in Hollywood. Instead of shots of iconic New York City landmarks, you get Gene Kelly and Frank Sinatra at the Hollywood Bowl and on MGM's back lot (rare Technicolor footage from a lost age). 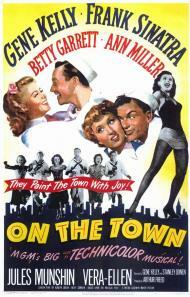 Sinatra and Kelly would complete the circle by starring in the movie version of On the Town in 1949. 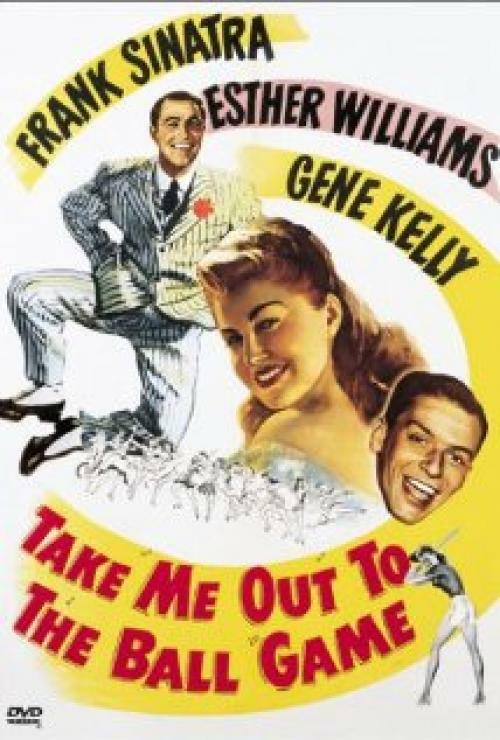 Frank Sinatra has his moments (his best being when he sings the forlorn ballad “I Fall in Love Too Easily” in an empty Hollywood Bowl) but more than their other two movies together this one belongs to Gene Kelly. Sinatra may have been top billed but it was Kelly who was nominated for Best Actor (the movie got a nod for Best Picture too, and Georgie Stoll won for Best Score). This was Kelly's first opportunity to choreograph an entire picture and he didn't disappoint. Eric mentioned the dance duet between Kelly and Sinatra near the beginning of the movie. Sinatra tries his level best, and to his credit he manages to get all the way through it and he even nails the landing. But my brother's right about the amount of visible effort it takes for him to keep up with Kelly. You can see him counting his steps in his head and several times he glances down at Kelly's feet to make sure he's in step. There are three main dance sequences choreographed and performed by Kelly. In one he woos Kathryn Grayson on a fantasy Spanish courtyard set. It culminates with Kelly swinging on a 45 foot vine from a rooftop to a neighboring balcony (am I crazy or was this shot recycled for The Pirate (1948)?). In another he dances across a studio rendering of Olvera Street (a traditionally Mexican section of L.A.) doing his version of the “Mexican Hat Dance” that has a few cute moments. The third major dance sequence being -of course- the fantasy dance with Jerry the Mouse – who was MGM's second choice after Walt Disney nixed Mickey Mouse's participation. I appreciated the music of cute-as-a-button soprano Kathryn Grayson and classical pianist Jose Iturbi a bit more than Eric did. Seventy years ago classical music and opera were both more widely enjoyed than they are today. 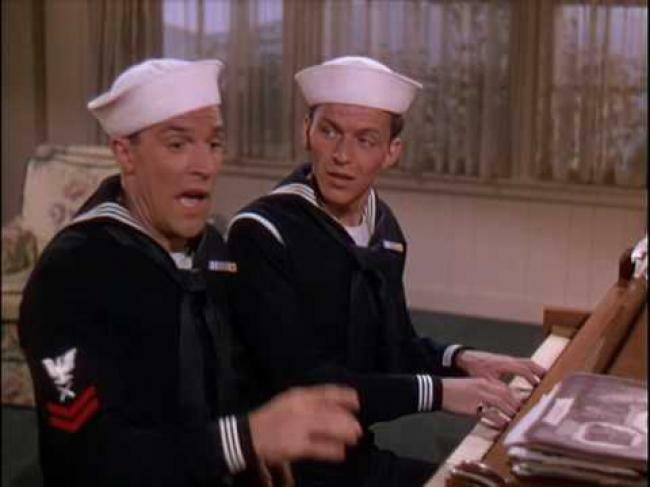 It was common in musicals of the day to feature “cultured” music made for the masses and Anchors Aweigh is a perfect example. While these musical interludes do slow the story down a bit they don't seriously mar the picture. For Dean Stockwell and Pamela Britton, Anchors Aweigh marked their film debuts. Stockwell would have a successful career as a child star (The Boy with Green Hair (1948)) and go on to have a long career as an adult (Dune (1984)). As of this writing he continues to act as he approaches his 80th birthday. Britton is best remembered today as the ditzy, busybody landlady on the 1960's sitcom My Favorite Martian. She died of a brain tumor at the age of 51 in 1974. Anchors Aweigh is an important motion picture in the history of the musical genre. It was the first time audiences got to see Old Blue Eyes as it was Sinatra's first movie shot in color. It was the first collaboration between Gene Kelly (1912-1996) and Frank Sinatra (1915-1998), two of the most popular and influential artists ever to appear in a movie musical. It was Gene Kelly's first opportunity to take full flight as a creative force. It features rare Technicolor footage from MGM studios and the Hollywood Bowl in 1945, and it produced one of the most indelible moments from any musical made during the golden age of the Hollywood Musical (see photo). Not bad. Pamela Britton and Frank Sinatra in Anchors Aweigh. I disagree with Eric that Take Me Out to the Ball Game is an improvement over this film. In a lot of ways the pairing of Frank and Gene peaked with this, their first outing together. They were certainly better in Naval uniforms than baseball ones. The biggest difference between this film and On the Town, their other Navy musical, is that while that later one is played purely for laughs, this one is marginally more grounded in reality and packs a little more heart. From my brother's descriptions of Sinatra's dancing I was prepared for much worse, but the truth is, he's really not that bad. Sure, compared to Kelly, he's an amateur, but it was a rare dance partner who could keep up with Gene Kelly. Although, it is obvious that Sinatra was more relaxed in their later films together and his dancing and his acting became looser with experience, he still demonstrates a screen presence and plenty of unpolished talent. Although Eric's right that Kelly and Sinatra would continue to play basically the same characters in all of their films together, here they feel the most like real people. Sinatra seemed to grow more innocent and naive in each film, despite being older in each one. He's innocent and inexperienced here, but not comically so. He gets to sing a few serious ballads like, "What Makes the Sunset?" and his best number, the one Patrick mentioned, "I Fall in Love Too Easily". That moment demonstrates more than anything else, just how different this film is to the later two Kelly/Sinatra pairings. Such a melancholy moment, with a lonely Sinatra singing such a touching ballad, would seem out of place in Take Me Out to the Ball Game and On the Town. While, like Patrick, I enjoyed Kathryn Grayson's singing, I do agree with Eric that Iturbi's piano playing, despite being damn good, does stop the movie and adds unnecessarily to the running time. Honestly, his character isn't even needed, but clearly the studio wanted to feature him. Even so though, they could have edited his scenes better. For instance, when Sinatra and Kelly see him playing from a distance at the Hollywood Bowl, instead of cutting to him and a dozen other piano players performing on stage, they could have at least intercut Sinatra and Kelly running through the bowl, into the piano playing so that it seemed like part of the story. It's never a good sign when you can simply excise a scene completely without making the slightest difference to the plot, but you could do just that with Iturbi's musical moments. However, while the same could be said about Gene Kelly and Jerry the mouse, to cut that scene would be a true loss. Sure, it doesn't have a damn thing to do with the plot, but it's pure movie magic. I was familiar with that scene long before I ever saw this movie. I'm sure the technology behind it would seem laughably simple by today's CGI standards, but even with their limited tools, it is edited and timed to perfection. The point Eric made that truly captures the secret to the success of this movie and their future endeavors together, is the magical chemistry between the two male leads. They make a great pair and have that rare ability to just seem natural together. It's easy to believe these guys have been friends for years. And according to all reports, the two got along as well off screen as they did on, which no doubt aided greatly to their movie chemistry. Interestingly, the two of them almost made a fourth picture together when Sinatra invited Kelly to direct 1964's Robin and the 7 Hoods. However, just 3 weeks before principal photography, Kelly left the project. Although no one seems to know for sure exactly why he left, rumors at the time spoke of Sinatra, who was also producing the film, not being comfortable taking orders from Kelly and didn't want to fall back into the subordinate position in the partnership. Other reports say that Sinatra didn't approve of the level of choreography Kelly was planning on bringing to the film. Whatever the reason, it must make any fan of the duo sorry that they couldn't work out their differences. My most common complaint about movies is that they tend to run too long. However, despite this one running close to an hour longer than Take Me Out to the Ball Game, I find it to be far the superior film. Everything in it doesn't quite add up to perfection, but there are plenty of individual perfect scenes in it.